Your best choice for Shelby Township Chiropractic! 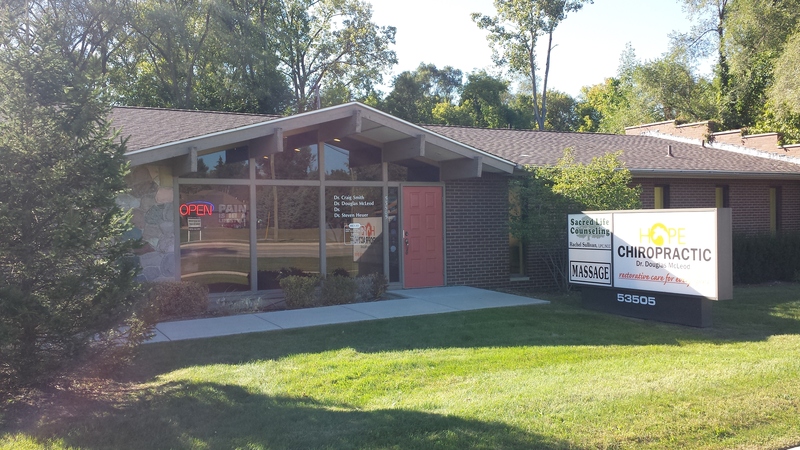 Are looking for a professional chiropractic clinic located in Shelby Township, MI 48316? Find your home at with the Shelby Chiropractor at Hope Chiropractic. Hope Chiropractic opened in 2009 under the direction of Dr. Craig Smith and his wife Dr. Renee Smith. Hope Chiropractic is located on Van Dyke between 23 and 24 mile. The Shelby Township chiropractic office features an open adjusting bay, a consultation room, a examination room, digital x-ray, and two massage rooms. Going on 10 years, we proudly serve the Shelby, Macomb Township, Washington, and Romeo Communities. In practice as well as online, the Hope chiropractors and staff strive for excellence through superior patient treatment, education and satisfaction.